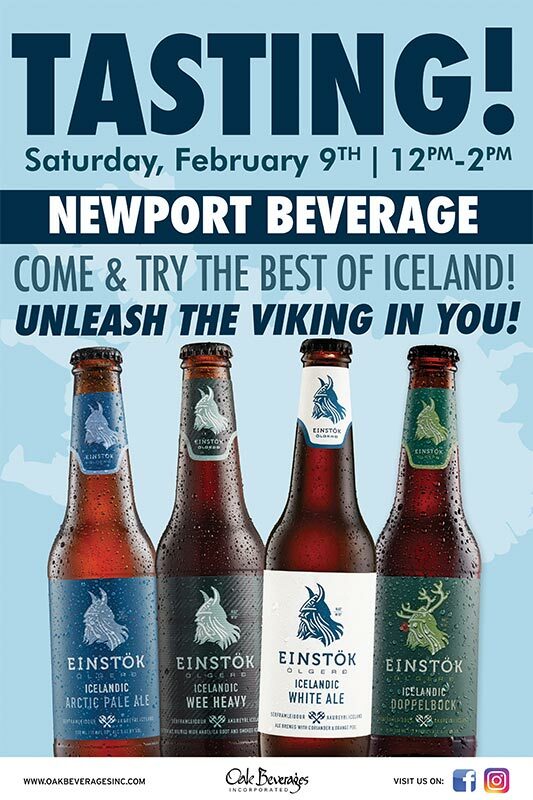 Newport Beverage Einstok Tasting - Oak Beverages Inc.
Newport Beverage Einstok Tasting, Saturday, February 9th, 12pm – 2pm. Come and try the best of Iceland! Unleash the Viking in you! With over 25 years in beers business and our newly remodel store which now offers walk in coolers. We carry one of Orange County’s largest selection of domestic, craft and imports beers. We also have one of the best growler stations in the area. Be sure bring your growler on Monday and Thursday to take advantage of $2.00 off. Wholesale distributors and we welcome retailers open accounts for tax exempt. Having party or corporate event? Let us cater your next party or corporate event. Delivery available on minimum purchase of $250 over.